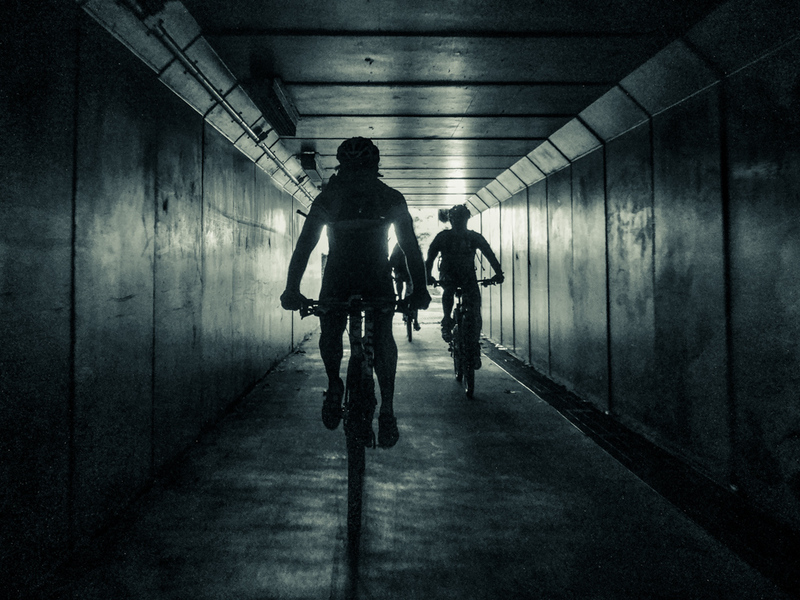 Darb wants to cycle over 1,100 km during the month of October to raise funds for cancer research. 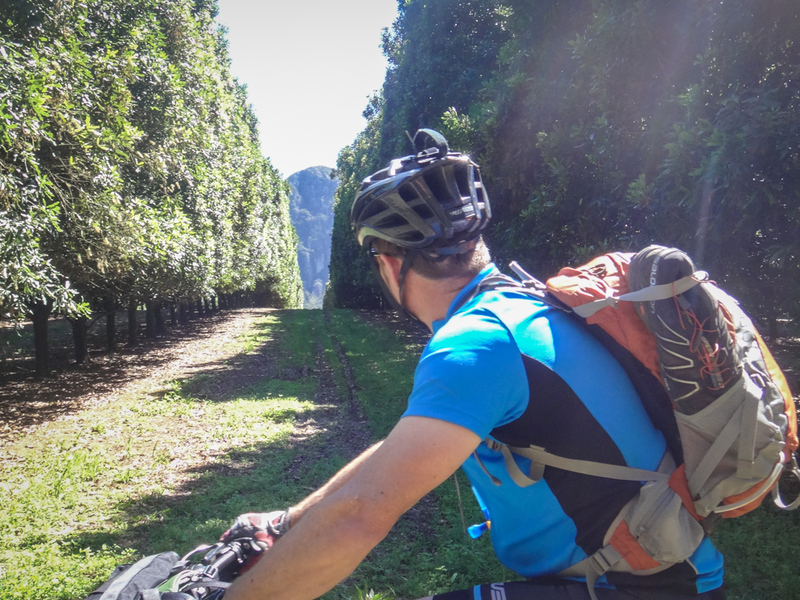 We decided to support him by starting the month with nice long ride through some of the vast plantations north of Brisbane. 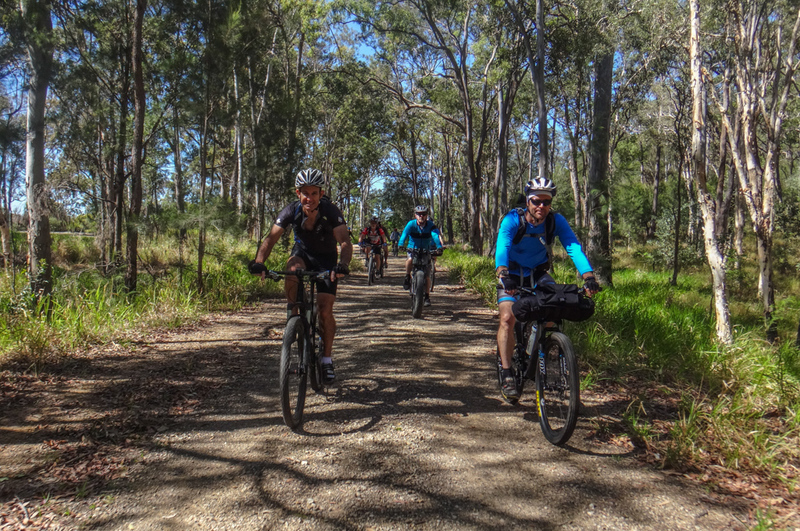 Four of us began our ride at Caboolture railway station, riding north towards the Glasshouse Mountains. 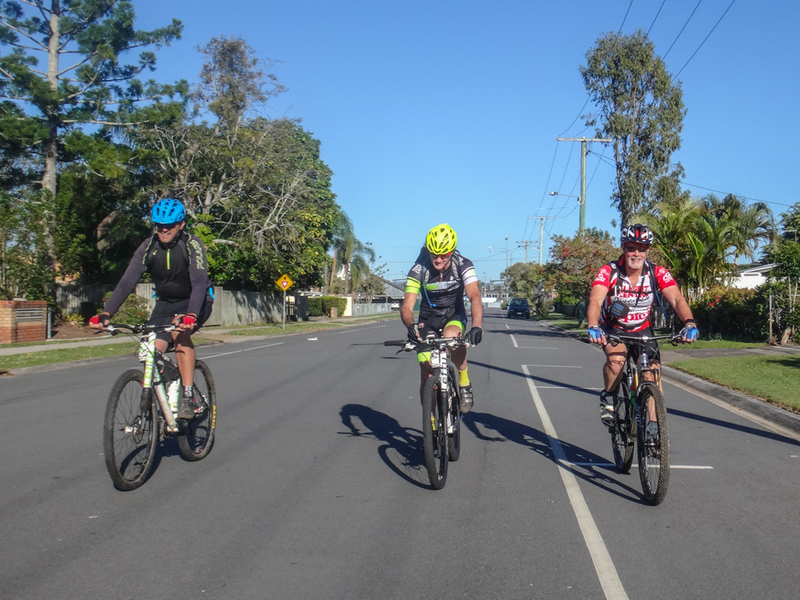 At the same time, Darb started from Landsborough and headed south to meet us. 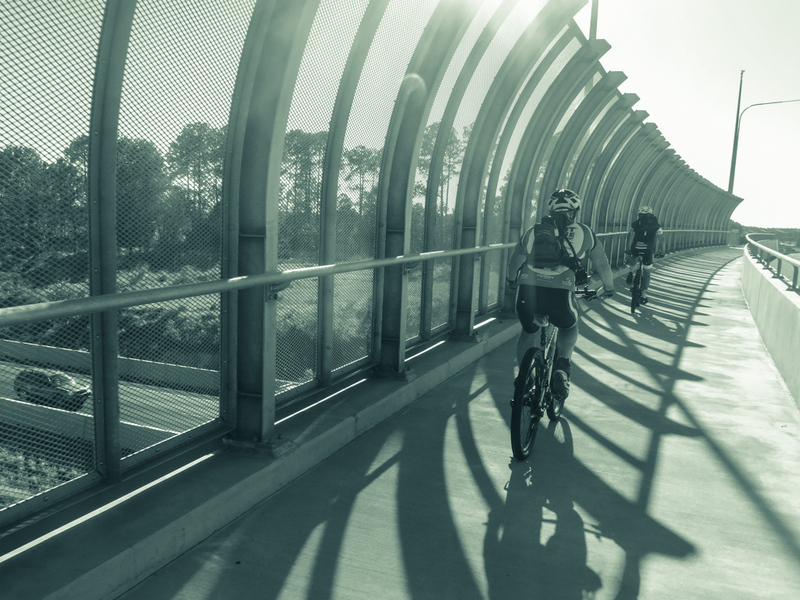 We followed bike paths and walkways out of Caboolture, avoiding traffic as best we could. The plantation is huge. 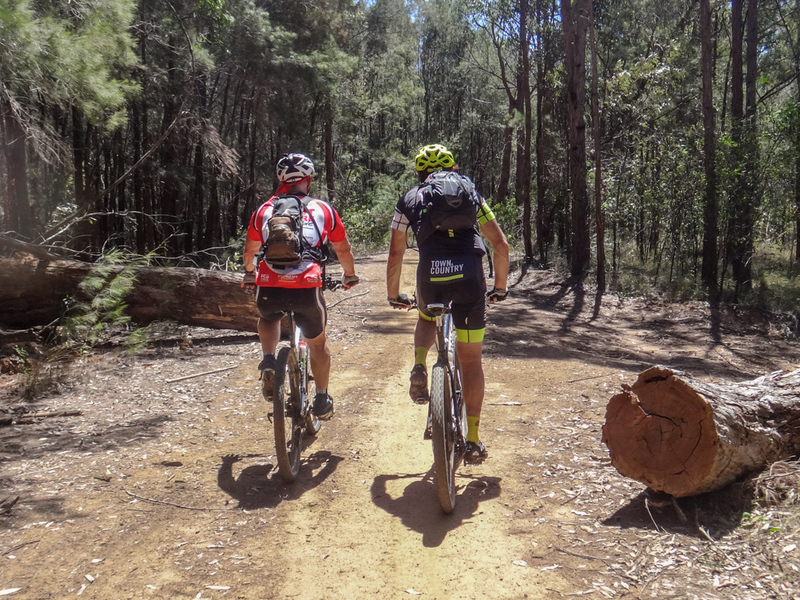 Pine trees stretch in all directions, from Woodford in the west to the Bribie Passage in the east. 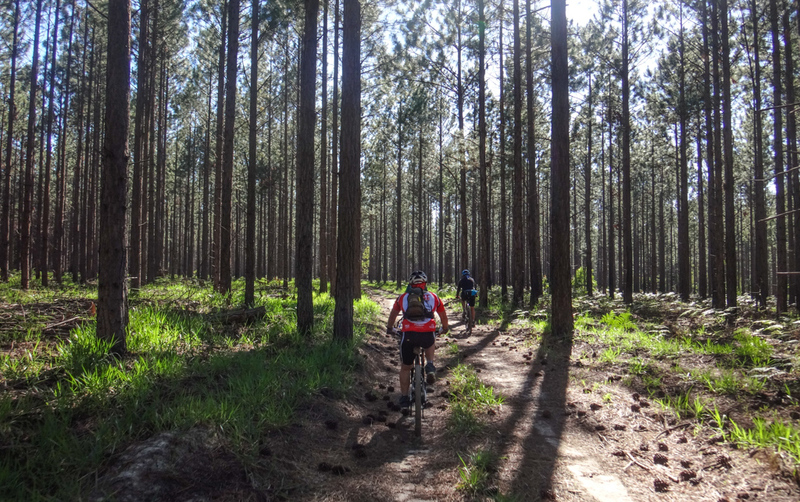 It’s exhilarating to leave paved roads and be immersed in miles and miles of trees. Sunlight filtering through the pine needles made the tree trunks look like a huge three-dimensional Jackson Pollock painting. 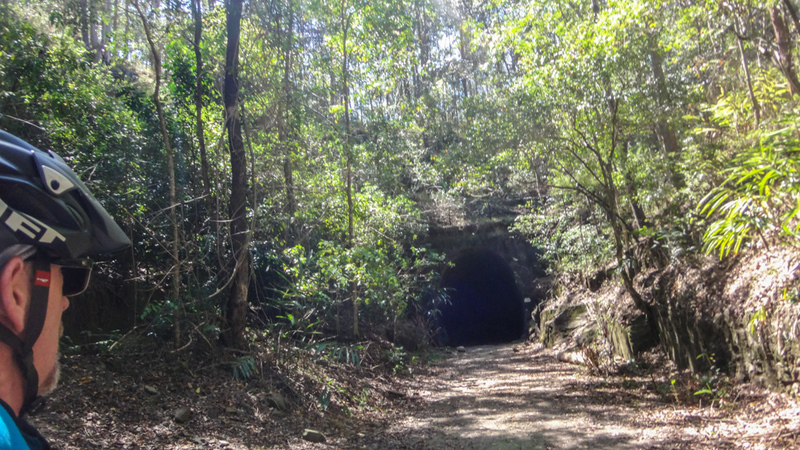 Because plantations don’t grow well near damp creek beds, you’ll often find long stretches of native scrub lining the waterways in a plantation. 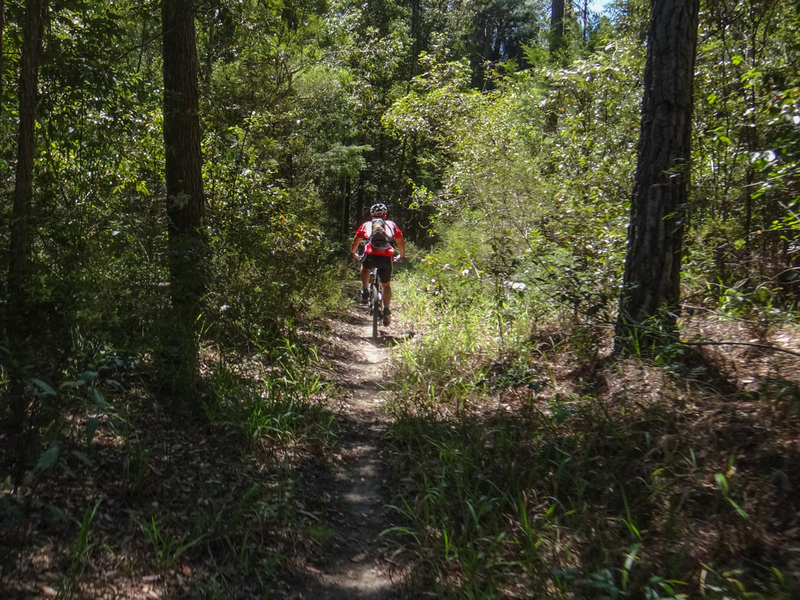 We followed a twisty narrow track along one of these creeks to add a bit of variety to the terrain. 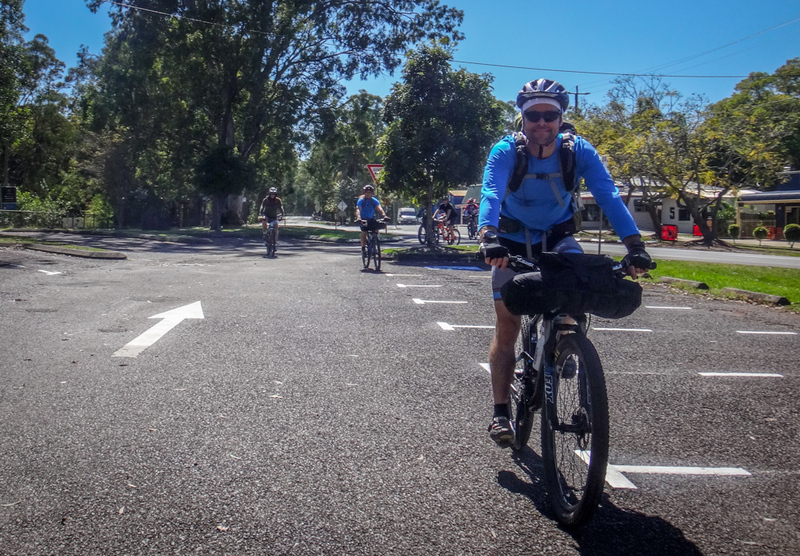 Darb eventually caught up with us a few kilometres outside of Beerburrum and rode with us into town for a quick snack. 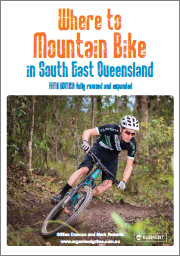 By chance we met a few other mountain bikers at the Beerburrum cafe. 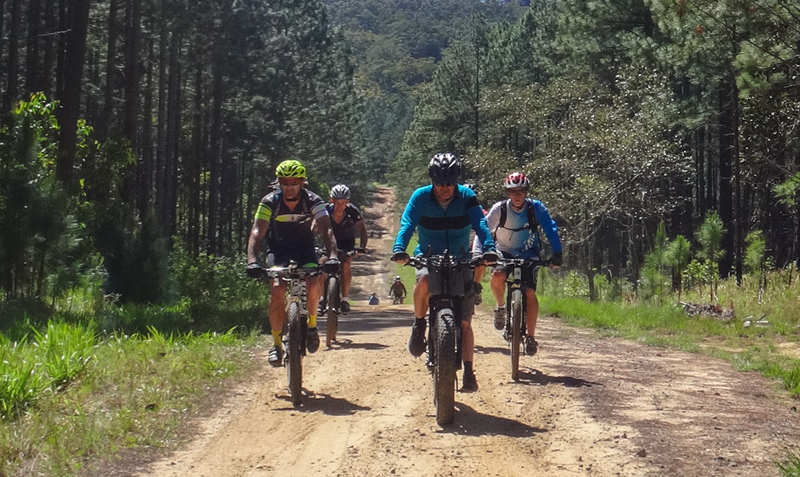 My friend Craig and his mates were out camping for the weekend and agreed to ride with us for a few kilometres. 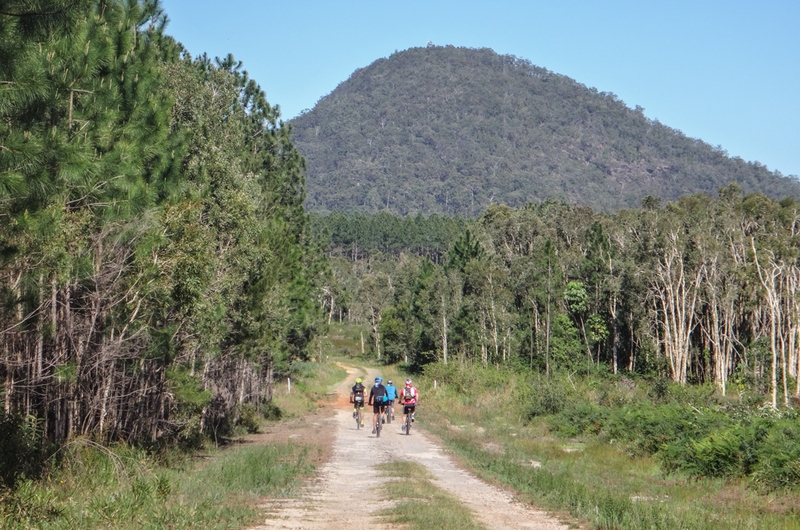 There were now more than dozen of us as we followed rocky tracks behind Mount Tibrogargan along the boundary with a macadamia orchard. 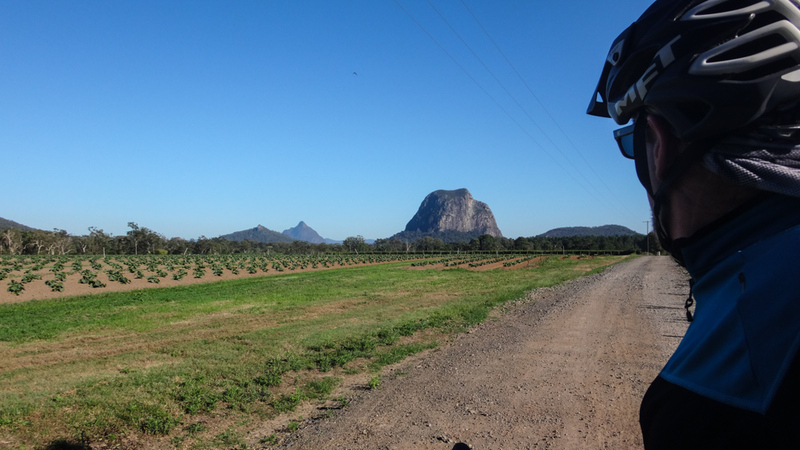 Mount Tibrogargan peeked through narrow rows of nut trees as we rode past. Halfway up the hill we left Craig and his mates to their weekend adventure while we continued to the lookout. 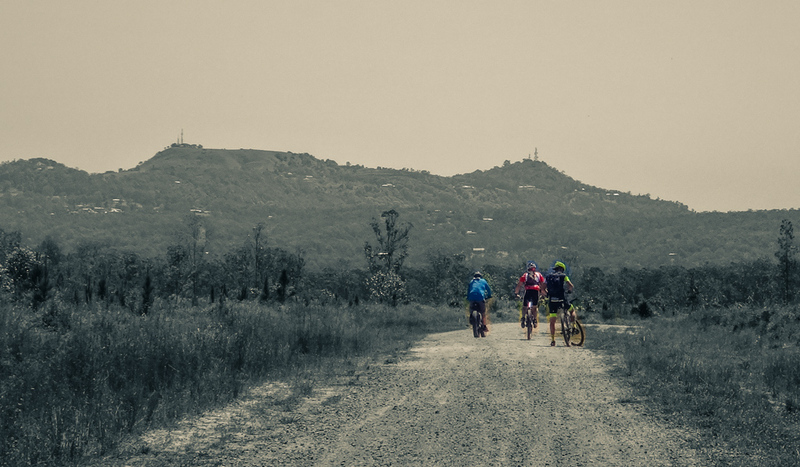 On previous rides we followed a steep rutted track up the hill and had to walk part of the way. Today we took an easier track up the hill. It was still steep, but we were able to ride the whole way without having to get off and push. It was a perfect day. Under a cloudless sky we enjoyed a clear view from the summit stretching over wide plains of pine trees toward the pacific ocean. But we had a deadline to meet – our train left at 1:30pm. We kept our rest stop short so we would have plenty of time to catch it. 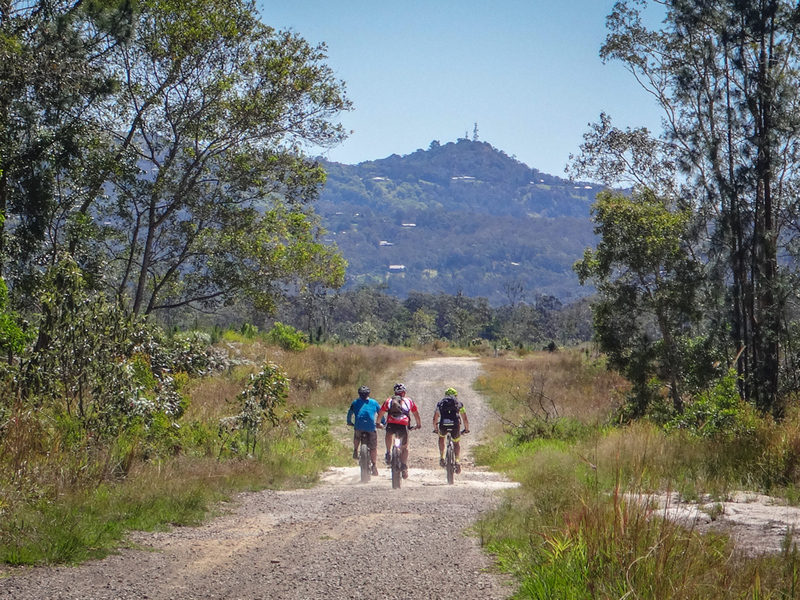 We followed Connection Road northwards around the back of Mount Beerwah. Power lines stretched from one horizon to the other. 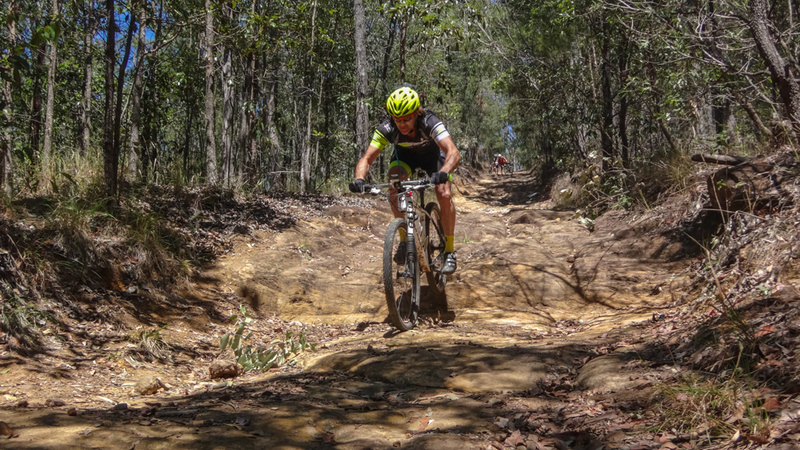 As my eyes surveyed the bright orange track which meandered under the lines and over the numerous hills, I felt like I could have ridden for hours if I really wanted to. 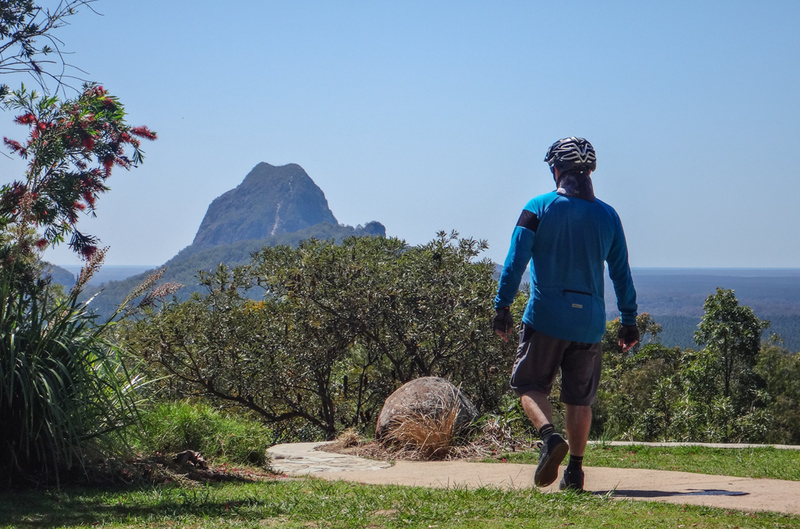 Apart from its odd-shaped peaks, one of the unusual features of the Glasshouse Mountains is a steep escarpment which runs through the area from Mount Mee in the south to Mount Mellum in the north. We had climbed up that escarpment earlier in the day when we rode to the lookout. We now followed the edge of that same escarpment north, through Wrattens Forest towards Peachester. It was a tricky ride down the hill from the top of the escarpment. Yeates Road is very steep and rocky in parts. I walked down a couple of the more challenging drop-offs. Darb and Jason nailed most of them without having to get off at all. 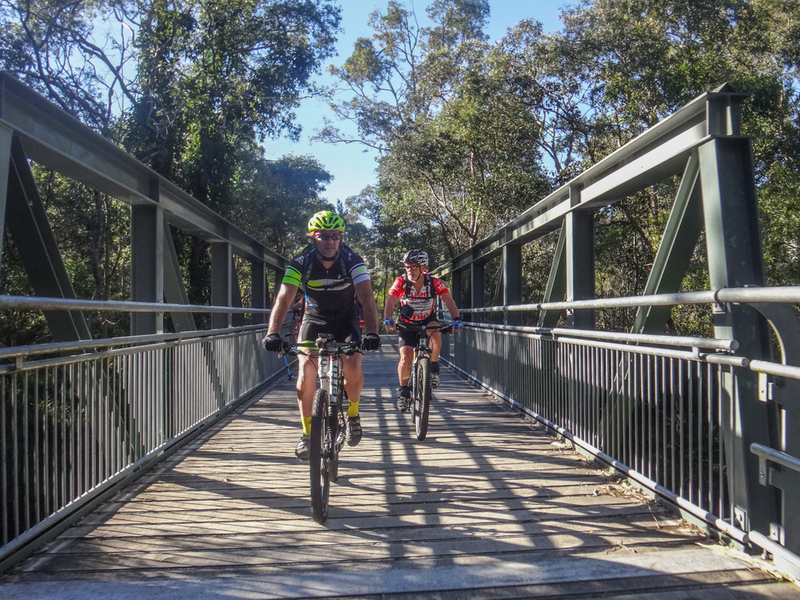 After the most challenging part of the descent, we enjoyed an easy roll down the remainder of Yeates Road towards the town of Beerwah. 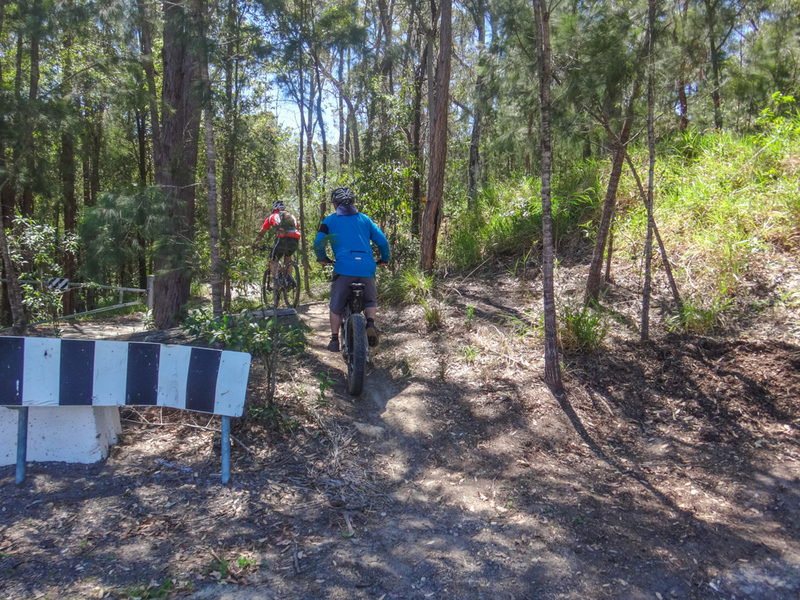 To avoid traffic we rode behind Mount Coochin and followed some quiet tracks and bike paths into town. 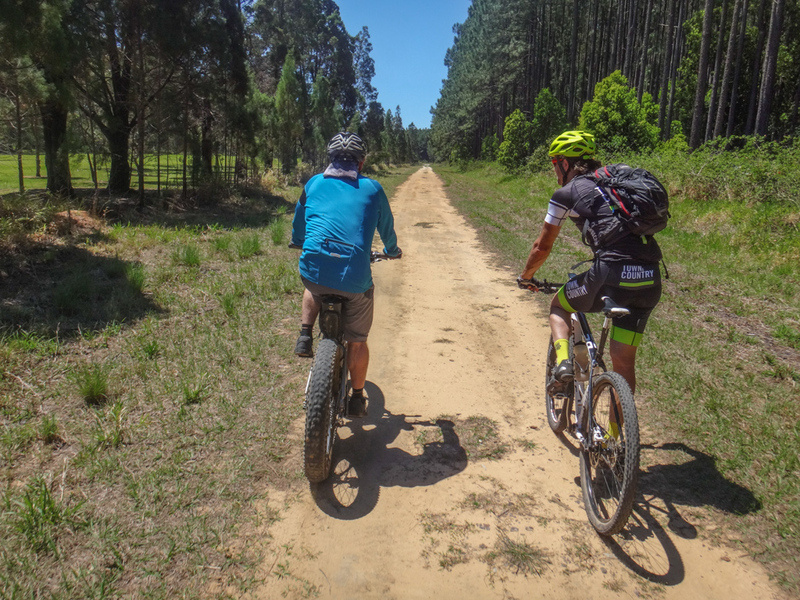 After a quick break we jumped back in the saddle and continued our trek towards Landsborough. 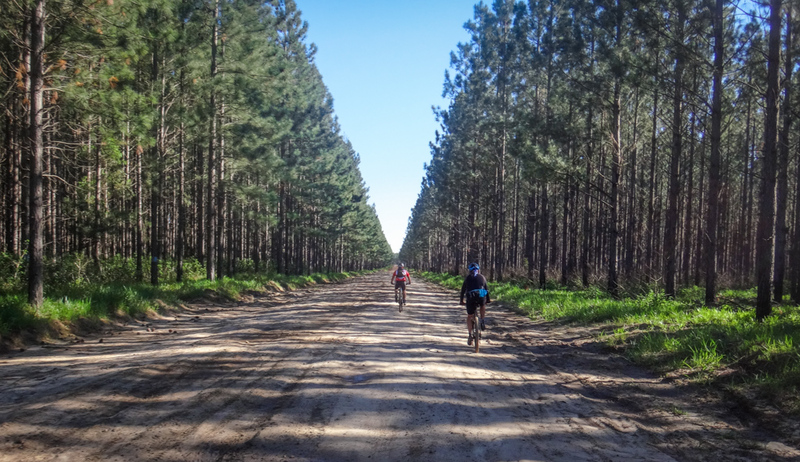 With a golf course on our left, and a pine plantation on our right, we followed yet another endless dirt track into rows and rows trees. As we had done earlier in the day, we left the wide forestry tracks in favour of the shady narrow trails which followed the creek. Plantations are dynamic places: the continual cycle of harvest and replanting constantly changes the landscape. 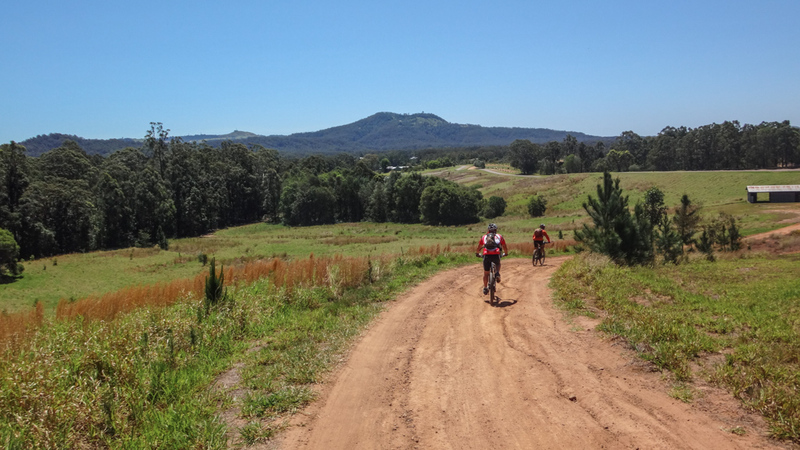 As we emerged into a recently cleared wide expanse we were struck by the impressive views of Bald Knob and Mount Mellum in the distance. Several months ago, tall trees would have obscured our view of these hills. 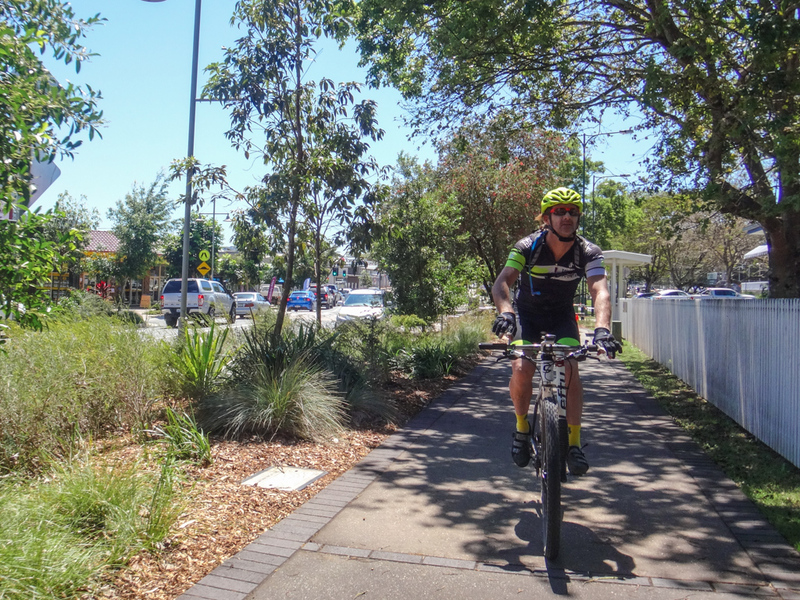 We rolled into Landsborough around 1pm. We had half an hour until the train arrived. 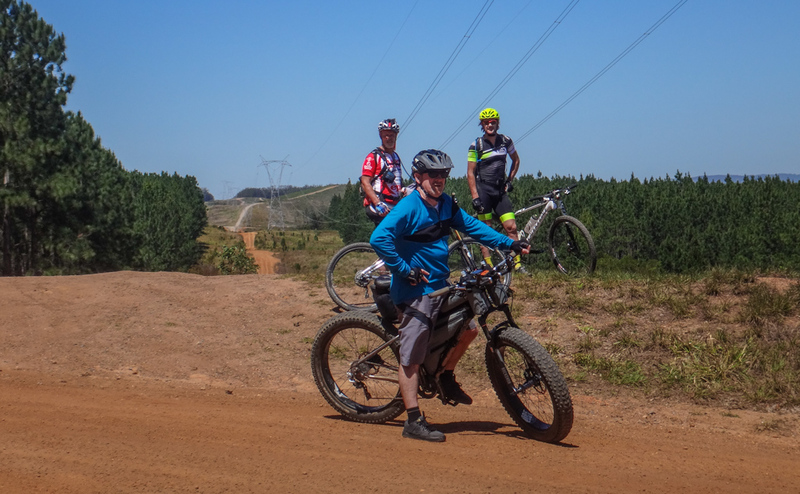 Darb wanted to ride another ten kilometres which would notch up a total of 100km for the day for him. 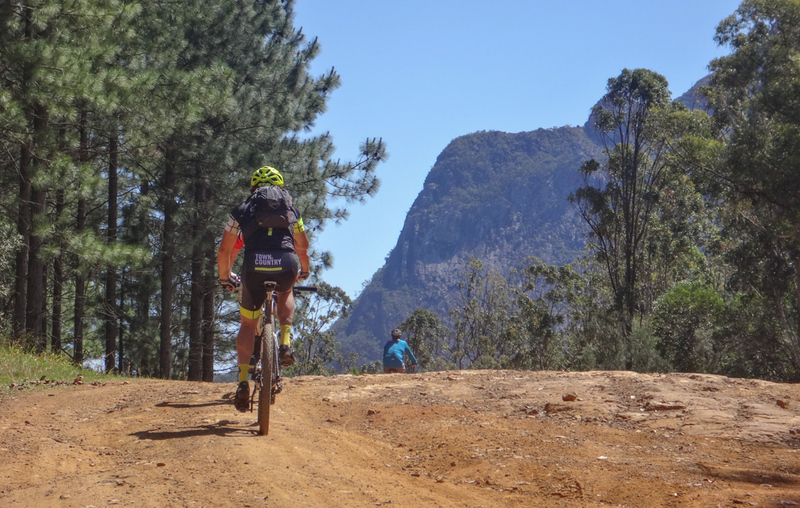 He didn’t flinch, and heroically continued his epic ride alone while we cooled our heels in the Landsborough Hotel. Half an hour later, the train pulled up across the road. 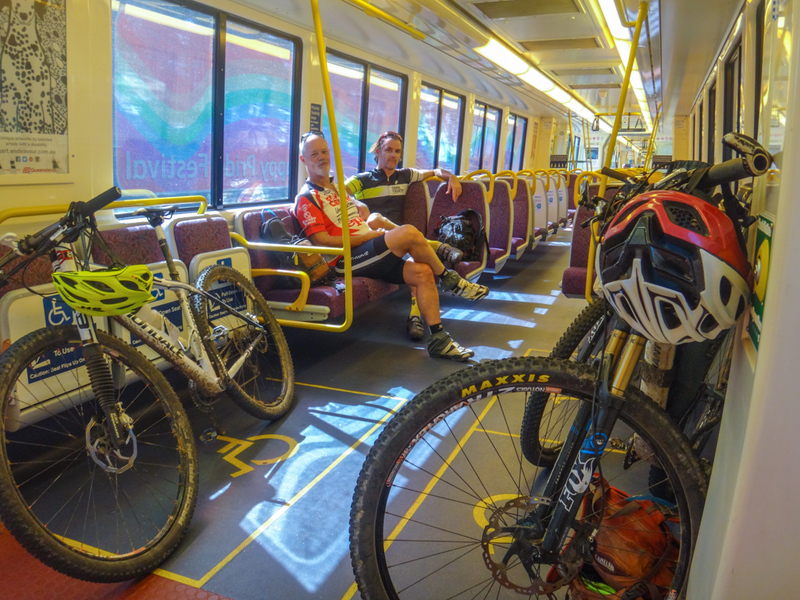 We loaded up the bikes, sat in the cool air-conditioned carriage and enjoyed the trip back to Caboolture. I’ll rate this ride 7.5 out of 10 on the tough-o-meter. Darb’s effort rates about 8.5 out of 10. Thanks Darb, Paul, Jason and Peter for a great day out. Thanks also to Craig and friends for sharing some of the journey with us. 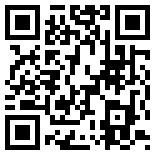 Please consider contributing towards Darb’s fundraising effort to help fund cancer research. Great photos Neil. It looks like an interesting ride that I would be keen to follow. Is it all public land (thinking I could just followed your track)? Hi Dave – all public land, no dramas 🙂 Enjoy! Kudos to Darb for his target of 1100km. 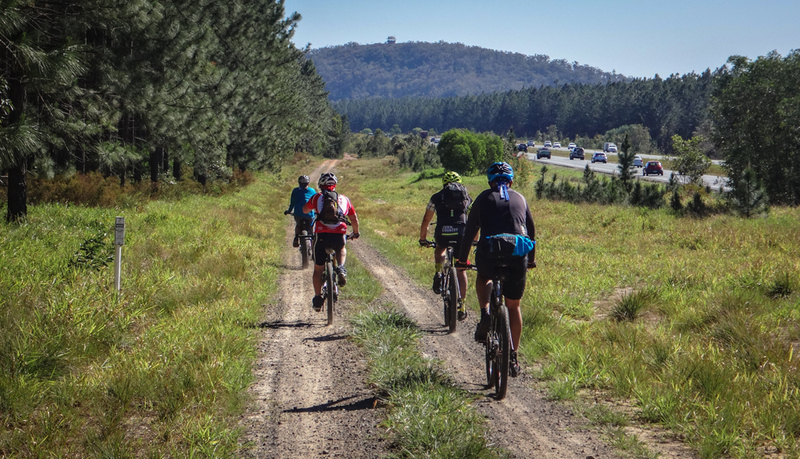 I’m doing the Great Cycle Challenge too but riding “only” 650km. Might have to follow this ride to notch up some k’s. 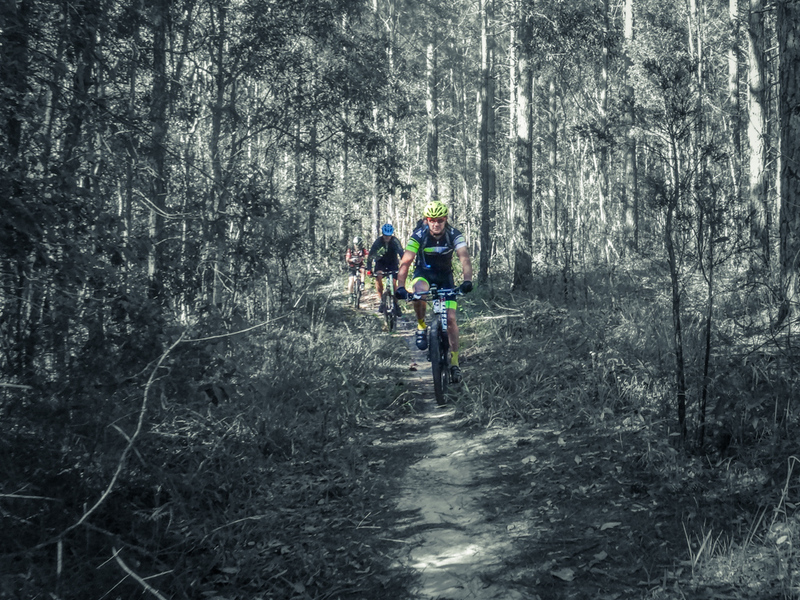 Hi Brad, How’s the km’s and the $’s going in October? Are you on target?